Tips to Heard Optimally and Effectively - Mostly, people do not listen with attention. Even though, listen to optimally and effectively can make a huge difference in our relationships with others. 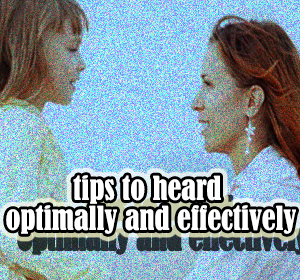 These are tips to heard optimally and effectively. First. Make heard as a conscious choice, not a passive reflex. The physical condition of the tired, the mood is not good, and high-stress levels can be prohibitive us to listen to the optimum. Our minds are being met sometimes are no longer able to accept the additional burden while listening to the other person. Second. Say honestly to the listener when we are not ready to give full attention to hear. It is not easy for us and the other person, especially to the people of Indonesia are more often felt uncomfortable or uneasy. Generally, we feel uncomfortable rejecting a friend who wanted to vent. The other person was not necessarily able to receive our honesty. Instead, they could have been offended because they feel neglected. Practice, to be truthful when we are not ready to listen. Say politely to the listener. Then, propose another opportunity to talk. In essence, if we had chosen and decided to listen to, carry out the full selection of body, mind, and heart. Third. Leave aside our expectations. Listening to someone seriously means to hear what he says and not filter his words match our expectations or what we want to hear. Do not let our personal problems, which is much more interesting, keep us from giving full attention. Be a neutral and objective listener. Try to understand the position and situation of complete interlocutors. If the person was expecting a response from us, do not rush to conclude in accordance with the opinion or perspective. As proof that we have a serious listen, ask a few questions related to the topic of conversation. Asking questions is a form of our attention as listeners. But remember, this is not just a question preamble, you know. Ask questions about things we do not understand or things we want to know more away from the subject. May also submit questions in order to make the perception. Who knew we misinterpret what we've heard. Our understanding of what is said to be heavily influenced by what we see and what we hear. In addition, removing our view of the interlocutors will give a negative impression that even the impression of hostility. Do not let this happen accidentally. People very often stop listening before they hear the whole message. Sometimes new interlocutors reveal what they really want to talk about when the conversation had lasted long enough. Again, this relates to the culture of the eastern countries that put preamble prior to the subject. Make sure we do not check out or stop listening too fast. It's good if we occasionally summarize what we have just heard to test our understanding. Listening to it is respect or respect for the other person. Respect is different than just feeling sorry for someone. Respect involves sympathy or even empathy, ie to understand the true feelings of the other person.We listen and not judge the other person. If we hear an emotional response from inside, take responsibility entirely on your reaction. Stay calm when you feel pressured is the best response from people with high emotional intelligence. Hopefully, we included in the class. Let's continue to practice being a good listener.